This will review the product Alpha-Focus made by XPI Supplements. This supplement is meant to heighten brain function, particularly in the areas of memory and cognitive function. Additionally it is stated to provide energy to the brain and keep it healthy. Read on to find out about its ingredients and our opinion of whether this is a product that is right for your brain-boosting needs. The active ingredients within Alpha-Focus are combined to provide nutrients necessary for electrical impulse generation, to care for brain cells and to keep acetylcholine at normal levels. Acetylcholine is a neurotransmitter that helps with memory and cognitive function, which is why the product is claimed to aid in increasing brain function in these areas. Alpha-Focus claims to be 100% natural. It is not clear whether this product is suitable for vegetarians. The dosage is two capsules a day for an adult. It is not suitable for consumption by those under the age of 18. The dosage appears to be similar to other products of this type on the market, which suggests that Alpha-Focus has the same strength as those products. Alpha-Focus is a dietary supplement and should be taken as part of a balanced diet. No side effects are outlined by the manufacturer but those who are pregnant, breastfeeding or who have a history of any sort of medical condition are advised to consult a physician before taking Alpha-Focus. A bottle of 60 Alpha-Focus capsules can be bought directly from the manufacturer for $49.95 although it would cost more from a retailer at $69.95. There is a 90-day guarantee for Alpha-Focus. The consumer is required to contact the manufacturer within 90 days of purchase and to return any unopened bottles alongside an open one. The guarantee is only good for one open bottle. A refund is given five business days after the manufacturer receives the products. There are no customer reviews on the manufacturer’s website about the Alpha-Focus. This product could well be an effective product as, in comparison to other brain boosting supplements, it seems to be strong enough to have the desired effect. The guarantee suggests that satisfaction with the product is expected. In addition, Alpha-Focus is good value for money when bought directly from the manufacturer rather than from a retailer. However, its positive effects are overshadowed by its potential side effects. Although no side effects are explicitly outlined, the product comes with a hefty warning. Anyone who has a prior medical condition must consult a physician before taking Alpha-Focus, which implies that it carries a risk for him or her. The level of risk is not known and so the product is potentially harmful. Although the other downsides are not as negative, they are still worth noting. The product is unsuitable for children, may not be suitable for vegetarians and product reviews are completely absent from the site. Lastly, the manufacturer is not GMP certified. 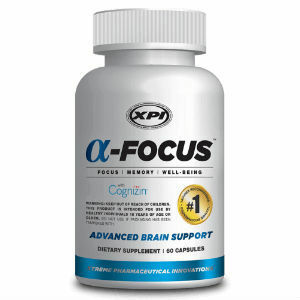 XPI Alpha-Focus might not be a product that is right for you. Henry Costa	reviewed XPI Supplements Alpha-Focus	on November 19th	 and gave it a rating of 2.5.